Doting father Vinoth Chandar made an animation character based on his little girl to amuse her. Today, it has grown into Asia's biggest YouTube kids channel with 14 million subscribers from 75 countries. Vanita Kohli-Khandekar traces the journey. Vinoth Chander of ChuChu TV. Vinoth Chandar wanted to amuse his two-and-a-half-year-old daughter Harshita, affectionately nicknamed ChuChu. That is how the Chennai-based techie made an animation character based on her. It sang nursery rhymes and songs, and his daughter loved them; but so did thousands of kids from around the world when he uploaded a couple of videos on the Web in 2013. Chandar then got together with four friends to set up ChuChu TV Studios. B M Krishnan rewrote the lyrics of nursery rhymes to make them more contemporary; Subbiramanian T S looked after finance and partnerships; Ajith Togo handled the legal aspect of the business; and Suresh Bhoopathy took care of operations and human resources. The five together ended up creating one of the world's biggest media brands for kids and the largest in India and the Asia-Pacific region by volumes. ChuChu TV's network of six channels -- in English, Spanish and Portuguese -- together has 14 million subscribers from 75 countries, bringing in 12 billion views on YouTube. 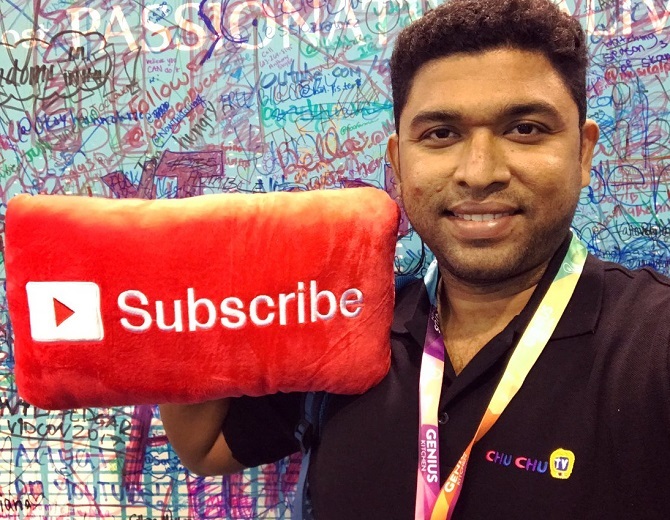 The company's flagship, ChuChu TV Kids Songs, has been among the top 100 most subscribed on YouTube globally for 18 months in a row, ranking 21st in April, according to online video curator Tubefilter. But can the company scale and grow beyond the limited world of the Google-owned platform? ChuChu TV Studios is said to be in talks with a large media firm for strategic partnership. Chandar doesn't deny it. "ChuChu TV is a big player in the YouTube pre-school space," says Gaurav Gandhi, COO, Viacom18 Digital Ventures. Viacom's VOOT is the other significant online player in this category. Roughly one-fifth of VOOT's 22 million monthly active users in India are on its VOOT Kids app watching Motu Patlu, Pokemon and Peppa Pig, among other shows. "In the last 30 days, the kids' category contributed approximately 16 billion in viewership across the world on YouTube. Of this, a majority was contributed by a few India-based YouTube channels (ChuChu TV and Kids TV)," says Subrat Kar, co-founder of video intelligence firm Vidooly. This puts ChuChu TV at the forefront in the ₹7,690-crore digital ad market that Google dominates. Typically, YouTube shares 55 per cent of the revenues it generates with the content creators. More than 80 per cent of ChuChu TV's traffic comes from outside India; and from this it derives a double advantage. While ad rates for kids content online are roughly 10 times those on TV, overseas ad rates are 5-8 times higher than the ₹200 to ₹300 per thousand views that Indian advertisers pay. "Till last year, we were spending our own money. Now the revenues are decent," says Chandar without giving any numbers. 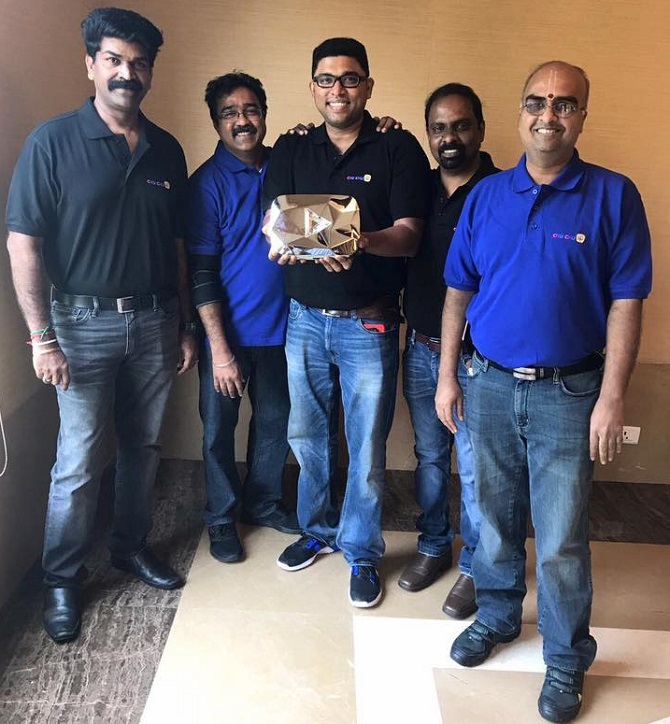 Vinoth Chander, centre, with team ChuChu TV: From left, Ajith Togo handled the legal aspect of the business; B M Krishnan rewrote the lyrics of nursery rhymes to make them more contemporary; Suresh Bhoopathy took care of operations and human resources; and Subbiramanian T S looked after finance and partnerships. Yet going beyond YouTube will be ChuChu TV's next big challenge. "YouTube is ultimately not your own platform. Today, it is promoting (ChuChu TV) because of the massive viewership," says Kar. Since Facebook and Google constantly change algorithms, it is possible the same content won't get as much viewership later. That is why almost every major content creator from Star India to Balaji Telefilms is building it own platform. Some of the smaller ones such as AIB or TVF tie up with the big guys or raise money in order to create their own brands. ChuChu TV serves a specific role in pre-school content by building characters and intellectual property. However, because ratings firms don't measure viewership below four years, pre-school channels don't show up in the audience numbers on TV -- a pre-dominantly ad-driven market where pay revenues are minuscule. As a result, pre-school channels such as BBC's CbeeBies struggled in India before shutting shop. Gandhi reckons that for a kids' media business to be sustainable characters have to travel -- to water bottles, pencils, games, films, live events and other revenue streams a la Chhota Bheem or Dora. The big question for ChuChu TV then is: "Can it extend its popularity and loyalty by building an offline business?" asks Gandhi. "On the content side, the top kids' shows in India are driven by local characters/IPs such as Motu Patlu, Roll No. 21 or Shiva. They control the ratings and bring in scale. And all of these big characters are not available on YouTube, so what is popular on YouTube is also a function of the supply side dynamics," he ssays. Chandar points out that everything needed to take the brand to the next level has already been put in motion. Hindi, Telugu and Tamil channels under production should be out early next year. There is ChuChu and Friends, a 13-episode series that could go over to TV. About a year ago, ChuChu TV launched on Amazon Prime and also released a free app with about 30 videos. This has hit 1.9 million downloads, claims Chandar. The idea is to use it to push games and educational apps. ChuChu TV has signed on with entertainment licensing firm Dream Theatre to bring out toys based on its characters. "Wherever we need to scale, we are doing. There is no worry," says Chander.